Vermont tournament bass angler Chris Adams recently won the third stop of the 2015 Champlain Bass Series, the Empire Challenge, weighing an 18.22-pound five-fish limit of bass that bested 26 other top tournament anglers from the Vermont, New York and New Hampshire area. Adams, who also won the opening event of the 2015 Champlain Bass Series–the Malletts Bay Melee–earned $5,000 for his victory and now leads the Angler of the Year points race going into the last of four tournaments held this season. 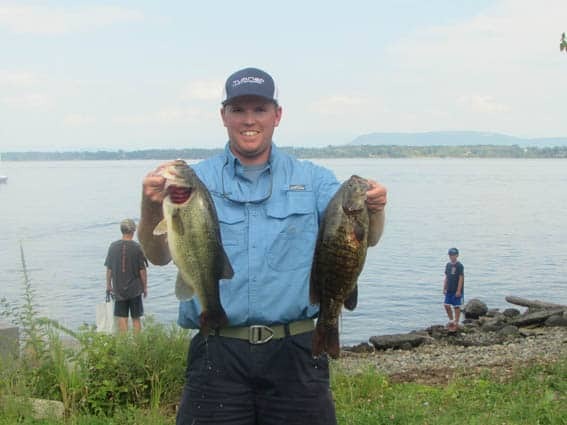 Adams fished a range of areas both north and south of the Champlain Bridge, targeting a mix of smallmouth and largemouth bass around both shallow and deep-water cover. Finishing in second place was Mike Smith of St. Albans, followed by Jon Case of West Swanton. The final event of the 2015 Champlain Bass Series is set for early October out of Ticonderoga, N.Y.
Adams finished second overall in the series’ 2014 Angler of the Year standings on the strength of multiple top finishes—including a win at the 2014 South Bay Shootout. Adams, 29, is a second-generation bass angler, following in the footsteps of his father Don, currently a U.S. Coast Guard-certified fishing guide based in Rutland. For more information results, standings, pictures visit www.champlainbassseries.com.